To ‘do’ Bergamo in three days probably the most convenient and cheapest way is to buy a 48 hour Bergamo Card, €15, and a One Day Airport Bus ticket €5. A little bit of planning should fill the 3 days remembering that (in order to make it seem a better deal) the Bergamo Card lists places that are free to everyone anyway so they can all be left to the third day. If used properly the Bergamo Card is, indeed, a good deal and allows you to get an idea of the city and its history. If travelling with very young children each card is valid for 1 adult and 1 child under six. 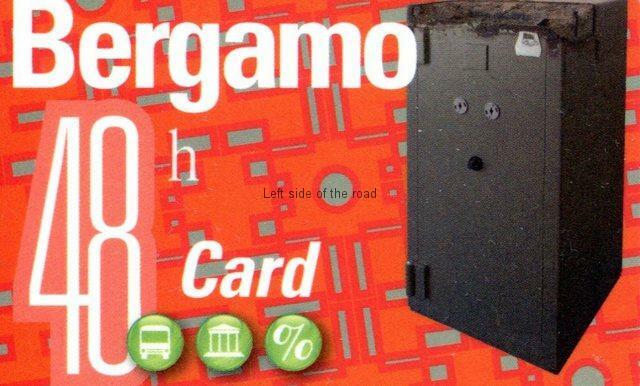 The Bergamo Card, is presently available for 24 and 48 hours from the time of the first use of bus ticket or after having been entered into the computer system at an attraction. If arriving by air you can get these at the airport from the transport company kiosk immediately in front of you once you’ve cleared customs, just to the left of the building exit. This kiosk also sells tickets for the buses going to Milan. The card is also on sale at the Tourist Information Office. There’s major building work going on at the airport at the moment (early summer 2014) but I don’t know how, or if, this work will have any impact on this information. The exact location might change but everything else should remain the same. If you wish to follow a similar trip that I did over the course of three full days a considered use of your time could work in your favour as you can gain from the dead time overnight before using the second card – just take into account when you want that card to start depending upon your flight arrangements. As is the case virtually everywhere in Italy in Bergamo you have to buy a ticket before getting on the bus. No driver will even have tickets or money if you attempt to buy one. If you are staying for any length of time in the city and don’t opt for the Bergamo Card makes sense to get one of the multi journey tickets. They are available for One, Two and Three days. One thing it’s important to remember is that being a foreigner won’t wash in Italy if you’re caught travelling without a valid ticket. Inspectors don’t get on the buses very often, from my experience, but trying to argue you didn’t understand because you’re merely a tourist will only get you a visit to the police station. Currently the fine is €53 if you pay within 60 days of the fine being levelled, it triples after that. So if you get a ticket don’t forget to validate it in the orange machine next to each entrance on the bus. Normally you get on at the front and the back and get off in the middle. There are two short cable car routes in Bergamo. They don’t really exist in the UK and are a different type of transport and worth going on just for the novelty. There’s no great excitement, the journey last little more than 5 minutes and you don’t race along. The route that leaves from the main road at the bottom of the hill to Città Alta is a pleasant way to arrive in the old town. The other route is the one that takes you up to San Vigilio and leaves from outside the walls at the north-western part of the old town. These are run by ATB so any of the travel cards cover the cost. Arrive or leave on a Monday but don’t make it the middle of your stay. As is the case in many European countries Bergamo’s tourist attractions tend to close on Mondays (apart from public holidays). You might even find that some of the eateries will also take that day free as the number of people moving around will decrease. This might be less of a problem at the height of the season but then if you can be in any way more flexible in your travel dates you wouldn’t want to go in July or August anyway. On the other hand for certain attractions being there at the weekend is useful. Two that immediately come to mind is the Donizetti Casa Natal (for opera fans) and the church of Santa Grata Inter Vites (for the macabre paintings behind the altar) – both in Via Borgo Canale. There’s a Tourist Information Office on the ground floor of the Gombito Tower, Via Gombito 13 in Città Alta. There’s also an office in Piazza Marconi, opposite the railway station, in the new town. The best map I came across was given away free in the ATB (the local transport authority) office in Largo Porta Nova in the new town. They tend to close at lunchtime. Going to restaurants before the normal lunch break for local workers will allow for a less hectic experience, this is especially the case with the two restaurants chosen on this blog, the Autogrill in the Città Bassa and Il Circolino in Città Alta. Also if you choose to buy food and go for a picnic the places along Via Colleoni can get hectic when the crowds arrive and as you have to order, pay and then collect you could waste a lot of time in queues. It might be stating the obvious but if you want to visit any of the main attractions arrive as soon as possible after they open. This doesn’t mean getting up at the crack of dawn as things don’t start opening until 09.00 at the earliest but getting the first hour before buses start to arrive from Milan is recommended. Especially in the low season, spring or autumn, Città Alta is quite pleasant in the early morning as cafés are starting to get ready for the rush and the Piazza Vecchia has few people around. On Saturday morning there are two street markets in the newer part of town. The arts and crafts is in the Piazza degli Alpini, at the bottom end of Viale Giovanni XXIII, close to the railway station. There’s a small building just up the hill from the Gombito Tower (the home of the Tourist Information Centre) on Via Lupo. Cost 25 cents. Fans of opera, and especially that form known as bel canto (of which both Rossini and Bellini were also well-known exponents), will be able to follow a route following the life, literally from the cradle to the grave and a few stages in between, of Domenico Gaetano Maria Donizetti in Bergamo. Donizetti was born in a house outside the city walls in Via Borgo Canale. 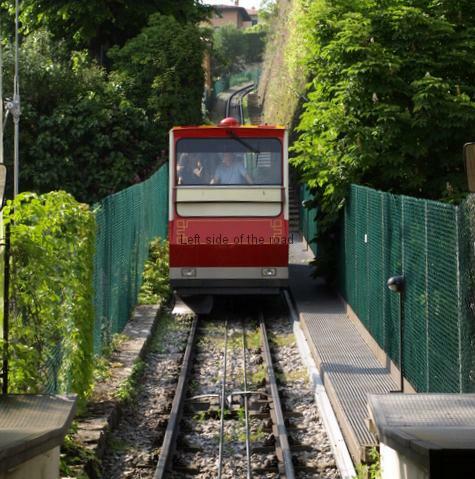 To get there go through the Porta di San Alessandro, pass below the San Vigilio funicular station and the street is the third on your right – going downhill. There’s not really a great deal from Donizetti’s time (although the house has been declared part of the National Heritage) but there is information about Donizetti’s life and the theatre in the newer part of town. However, it is an opportunity to get an idea of the type of housing of the relatively well off at the end of the 18th century. From here head down hill to the Church of Santa Grata Inter Vites. This was where Donizetti was baptised on 3rd December 1797. The plaque is inside the small door to the left of the main double door entrance on Borgo Canale. If you can get this far don’t miss the opportunity to see the macabre paintings by Vincenzo Bonomini (who was also born in the street and baptised in the same church – but 40 years before) which are behind the main altar. Head back into the walled city to Via Arenal – which is south-west of the principal religious and administrative buildings in the vicinity of Piazzas Vecchia and Duomo. (In fact Via Arenal and Via Borgo Canale were an extension of each other before the building of the large Seminario Vescovile.) At number 19 is the Donizetti Museum. This is a smallish museum on the first floor, up a wide staircase, and houses a number of paintings of Donizetti, examples of his manuscripts, the pianos he used, a small room with musical instruments from the period he was writing and – his death-bed. 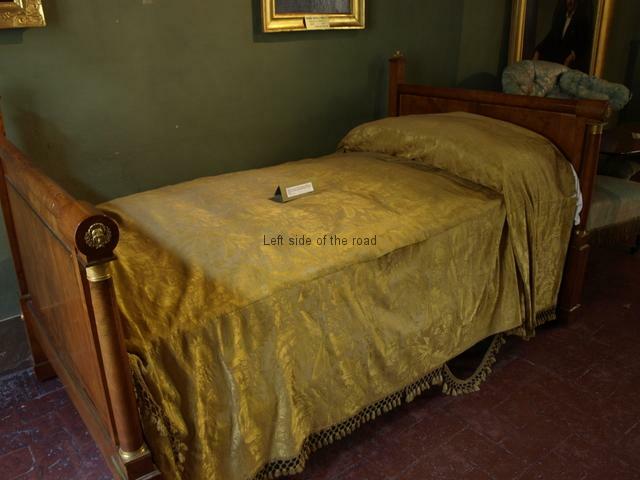 Looking at it you could imagine that Donizetti was quite happy to die in order not to have to lie on it anymore. Continue down Via Arenal and go into the Basilica di Santa Maria Maggiore by way of the southern entrance. A few steps into the building and then to the left, against the rear wall, is Donizetti’s tomb. However, this was not the first resting place for his bones. In 1845 he was diagnosed as suffering from cerebro-spinal syphilis which appeared to be eating away at him physically and mentally. This meant that different groups of doctors, depending upon who was paying them, came to different conclusions about what sort of treatment he should undergo and where. Having doctors fight over your fate is just about as bad as having lawyers do so and Donizetti seemed to be the only real loser. 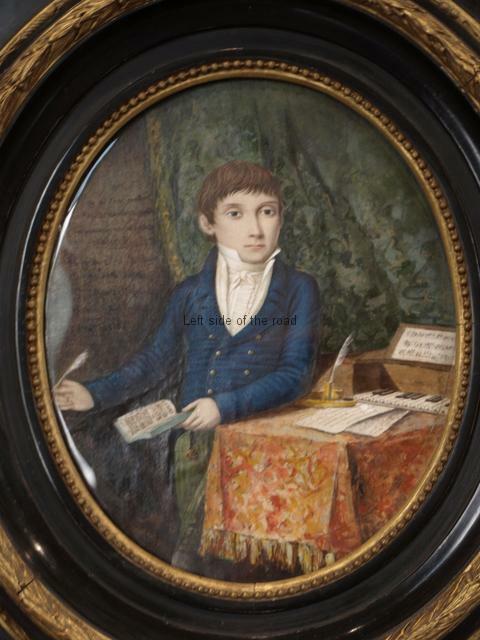 He returned to Bergamo in October 1847 but although greeted by the city’s dignitaries and wealthy (in one of whose houses he was offered a home) he eventually died on 8th April 1848. He was originally buried in the local cemetery of Valtesse (to the north of the Città Alta) but a few years later, in 1855, he was transferred to the Basilica where a large monument awaited his remains. This is the work of Vincenzo Vela – whose other work includes the monument to the 199 workers killed in the construction of the Gotthard Rail Tunnel between Switzerland and Italy. This is quite a charming monument. At the top Harmony sits in mourning, a lyre in her right hand as she looks down on a picture of Donizetti – presumably she wasn’t aware of his syphilis (or does it even matter?). On the front of the plinth on which she sits there are distraught putti, the seven musical notes, breaking their lyres in their distress. You have to head down to Città Bassa for the other two references to Donizetti. And they are both next to each other. The Teatro Donizetti is not far away from the Porta Nova, the principal crossroads in the new part of Bergamo, along the primarily pedestrianised Via Sentierone. This provides a full programme of performances, especially between October and June. 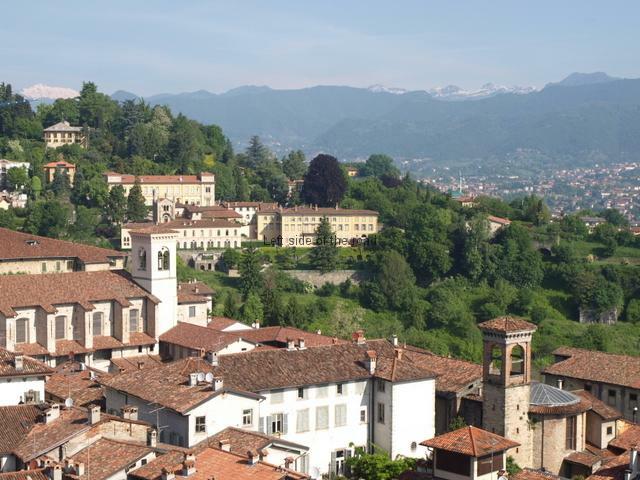 As well as a varied programme of opera there is also the Gaetano Donizetti Bergamo Music festival each year between September and December, where many of Donzetti’s works are featured as well as others from the bel canto tradition. 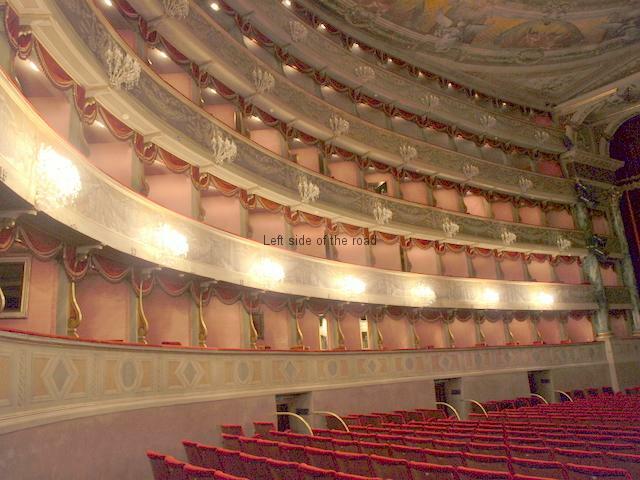 The theatre dates from the end of the 19th century but has undergone many changes, extensions and renovations in subsequent years without, as far as I can see, fundamentally changing the character of opera houses of the period. Apart from buying a ticket for a performance there are no organised ways to visit the theatre just to have a look around. If you travel with a group it’s worth phoning to see if you can organise a group visit. Otherwise I suggest you just try what I did on my last visit. I went to the ticket office to ask a general question about visits to the theatre. The young woman got on the phone and said that someone would be down in a few minutes. This was a pleasant surprise but soon realised that someone was taking their time off from their normal work to just let me into the place to have a look at the auditorium. But that was much more than I was expecting. Whilst only there for a matter of minutes and not getting a lot of information about the building it did satisfy my curiosity and I was able to get one or two pictures of the interior, without crowds of people who are the problem on performance days. Just try your luck – you’ve nothing to lose. In the square opposite the entrance to the ticket office is the final bit of the Donizetti trail in Bergamo. This is the Donizetti Monument in Piazza Cavour, the work of the Calabrian sculptor Francesco Jerace, erected on this spot in 1897 – at the same time as the opening of the theatre in the year of the 100th anniversary of Donizetti’s birth. A strange story surrounds this monument. The sculptor, Jarace, had previously offered this design to the town of Catania in Sicily as a monument to their home-grown bel canto composer, Vincenzo Bellini, a more or less contemporary of Donizetti. Catania said no but Bergamo said yes (after a three-horse competition which Jarace won). This seems like a return to the days of the Roman Empire when the torso of the person remained the same but the head was different and could be removed to save on the expense of creating a completely new statue. Does that, do you think, mean that Donizetti’s head is removable? No set times for visits to the theatre. However, if you are in a group it might be worth phoning in advance to see what is available. There will probably be a charge. With the idea that it’s possible to ‘do’ Bergamo in three full days I thought it would be useful to suggest that one of the lunches out of the three could consist of something a little less ‘formal’ than in a restaurant. I’ve already suggested the Autogrill in the Città Bassa and Il Circolino in the Città Alta so here I thought I’d offer some thoughts on snacking and organising a picnic at San Vigilio. Obviously eating al fresco depends upon the weather. I don’t know if I’ve just been lucky but during all of my three visits to Bergamo I’ve hit good weather. Yes, it was cold during the winter but most days were bright and rain free. The worse I’ve had to deal with were overcast days and an almost persistent haze that seems to hang over the town and the valley, presumably caused in no small part to air pollution. But a picnic on a clear day in winter is still an option, just need to make sure you wrap up warm. A starter in this al fresco eating experience could well be a bowl of polenta provided by the stall directly across Piazza Mercato delle Scarpe from the entrance to the funicular station. 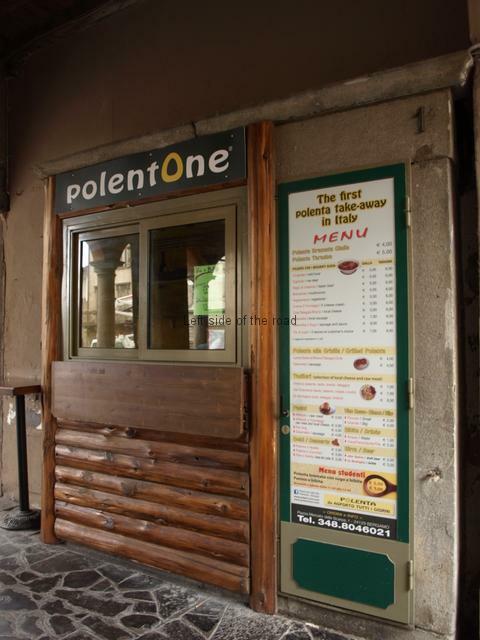 This advertises itself as the first polenta take-away in Italy – in English. I can’t verify that claim and it calls itself ‘Polenta One’ but whether there’s a ‘Polenta Two’ I’ve no idea. Behind the window hatch of this tiny stall is a machine which dispenses piping hot polenta (it took the skin off the roof of my mouth when I tried it) and other containers of the sauce of your choice. The selection is up on a board in both Italian and English. The stall is open from 11.30 – 14.30 and from 18.00 – 24.00. It’s designed as a take-away but there are a few places where you can sit and eat under cover of the building – so protected from the wet elements. If you have this snack soon after the place opens you can do some more visiting around Città Alta before heading up to castle and park for a picnic at San Vigilio. There are plenty of places to get snack food depending upon how hungry you might be, how many people you are catering for, how adventurous you want to be and how deep are your pockets. If you’re into pizza then the biggest selection is in the shop right opposite the entrance to the Teatro Sociale in Via Colleoni, just around the corner from the Piazza Vecchia. If you’re new to Italy remember that the price quoted is for weight (and not a piece). Also at busy times you order and get a bill, pay at the cash desk to get a receipt and then return to the counter to pick up your purchases. 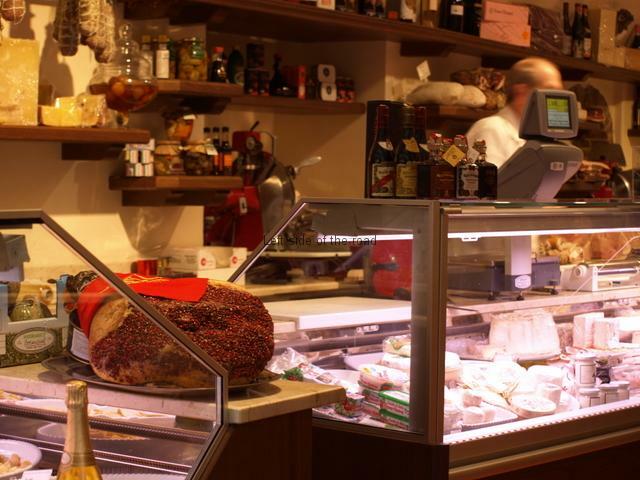 If you want to try local meats, cheeses and other delicacies I’d recommend the delicatessen Gastronomia at Via Colleoni 7, heading in the direction of San Vigilio. There you’ll find a large selection of local cheeses and salamis as well as huge pies with meat and cheese fillings as well as vegetarian options. A slice of those pies that will make a reasonable meal will cost you in the region of €6. This is not a particularly cheap place but it was the best place I came across for such provisions. There are a number of cake shops for those with a sweet tooth, one of the biggest being right at the end of Via Gombito, at the corner of Piazza Mercato delle Scarpe. 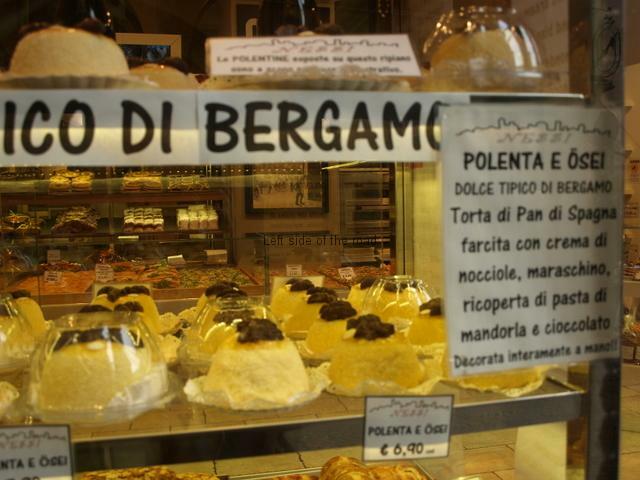 This shop displays the local sweet speciality, the ‘Polenta e Osei’ a hand shaped cake that’s a speciality of Bergamo. There seems to be as many different recipes as there are people to make them but basically consists of a sweetened polenta mix with a jam filling of some sort, perhaps with the addition of ground almonds. There’s an icing on the top and the chocolate is supposed to represent birds (the osie), sometimes artistically made. They vary in size (and price) but if you just want a taste the smallest I came across was sold in the pizza shop by the Teatro Sociale for €1.80. However, whichever place you choose to do your shopping it’s advisable to do so earlier rather than later as come lunch time some of these places are heaving. But I’ve left out the most important ingredient for a picnic – what to drink? If wine is your drink of choice then a little bit of pre-planning is necessary. The mark-up on booze in Città Alta borders on the criminal so a visit to a supermarket in the new town prior to picnic day is recommended. I tried two or three different Chiantis during my last trip and if you paid something in the region of €5-6 you would be able to pick of a very acceptable bottle. Here’s one tip people might find useful. Drinking out of plastic cups is never a good experience, whatever the contents. 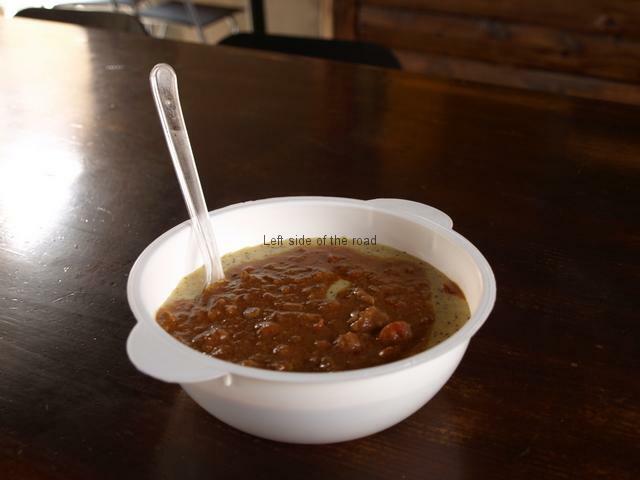 My suggestion is to buy one of the stainless steel cups that are often used for water in Indian vegetarian restaurants. These are light, sturdy and unbreakable and cost very little. Available in Asian supermarkets throughout the country. Once you have all your provisions head for the bottom station of the San Vigilio funicular. This is just outside the Porta di San Alessandro and the Largo Colle Aperto (where the No 1 bus down to the new town has its terminus). It’s only a short 5 minute journey in the small train and the cost is covered by the Bergamo Card or the daily travel tickets. They run about every 15-20 minutes. From the top station go up hill to the Castello di San Vigilio and go as high as you like when you run out of road. There are a few levels where you can look back down on the old town. On a clear day you’ll also be able to see into the high mountains, perhaps with snow – depending on the time of year. If you fancy an overpriced beer before heading back into town the bar next to the funicular station has a pleasant, covered, outside seating area. A beer here (less than a pint) will cost €4.50. You can either catch the funicular or walk down the obvious road back to Città Alta. If you’re in Bergamo mid-week and miss the regular opening times of the Santa Grata Inter Vites church, in order to see the macabre paintings behind the altar, you could make a slight diversion down the steps and see if anyone is around who you can try to convince to open up and let you have a look. On the way back into town have a look at the plaques with information about the town’s original basilica at the top end of Via Borgo Canale. A fitting end to a picnic at San Vigilio.